For the third and final post in my "behind the music" pieces on re-scoring three classic, short silent films, I give you one film that is, artistically, worlds beyond first two (which were: Frankenstein  and The Strange Case of Dr. Jekyll and Mr. Hyde ). This one, A Trip to the Moon, was made in 1902 by the early film innovator, Georges Méliès. Anyone who knows film knows this short feature and even those who are not film buffs are usually familiar with the iconic scene in which the moon is hit in the eye with a bullet-like ship. By this point in my journey into the musical orchestral sampling world (explained in more detail, here) I had acquired even better quality sounds than I used in the first two films, having stepped up to a library of symphonic sounds from EastWest called "Symphonic Orchestra." Yes, I was still blending this with some of the other less sophisticated sounds, but, overall, the quality had improved. Again, I had watched some other re-scoring attempts of this to get a sense of what others had done, but, yet again, I found myself disappointed by the modern ones. I am still not sure why composers see these old films at a palette for weird colors and sounds. I saw one re-scoring of A Trip... that used nothing but strange synthesizer drones, and while I think this kind of score can be effective, I just thing films like this need a more traditional approach. To me, A Trip to the Moon is, like the previous three films, filled with child-like wonder. I say this with no condescension. There is an innocence about film, in and of itself, in this that really moves me. These artists were truly opening the door to the magic of cinema; they were wide-eyed explorers of a new realm and this unashamed enthusiasm certainly can be felt in their work. In short, Professor Barbenfouillis is convinced he can make a ship go to the moon, and the film opens with him presenting the idea to his colleagues (sort of scientific/professorial/wizard-like chaps). A bit of an argument ensues, one poor fellow scoffs and has books thrown at him, and then the men settle down to support the professor's idea: They will shoot a rocket to the moon by using a large cannon. For me, the opening asks, musically, for a generous helping of pomp and maybe the underpinnings of a march as the beautiful young women and the scholars literally parade onto the set, which (as in much of Méliès's art) is done in a staggeringly cool tromp l'oye fashion Méliès's work is really a visual feast -- worlds beyond the accomplishments of the American film makers of my other two scores. This score needed to be textural, light-hearted, grandiose and -- at least for my money -- melodic. Again, I used the traditional thematic approach by writing leitmotifs for the Professor and for other elements and characters. But each visual corner turned allowed me to go down a separate path, sometimes goofy and sometimes beautiful. 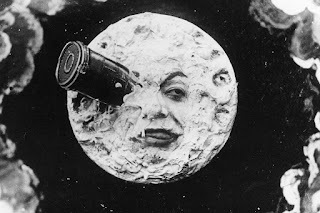 The scenes on the moon allowed me to open up and write some pretty bits, this time; the depth of the chords and melodies these scenes called for did not exist in the previous scores; the higher level of art of Méliès certainly pulled more out of me, musically. In fact, this score took me twice as long as the others to compose, having spanned more than a month for under fifteen minutes of music. I won't get deeper into the plot, because, unlike the other two, you probably don't know it well. Although this story was based on the work of Jules Verne, these books are not as iconic to the average reader as Frankenstein and ...Jekyll and Hyde -- so, more fun in discovery! (Though, I will tell you, because I got hung up on it for a while: apparently science had not yet figured out the zero-gravity element in space, so, in their minds, it was possible for someone to, say, fall off of the moon and into one of Earth's oceans...) Please enjoy the film and the music!